High summer, high heat, high humidity. Everything’s lushly green and growth pushes garden fences. Weeds abound and wild things encroach. I used to collect bowls of mulberries along my walk through the play field until the park district removed the low branches. 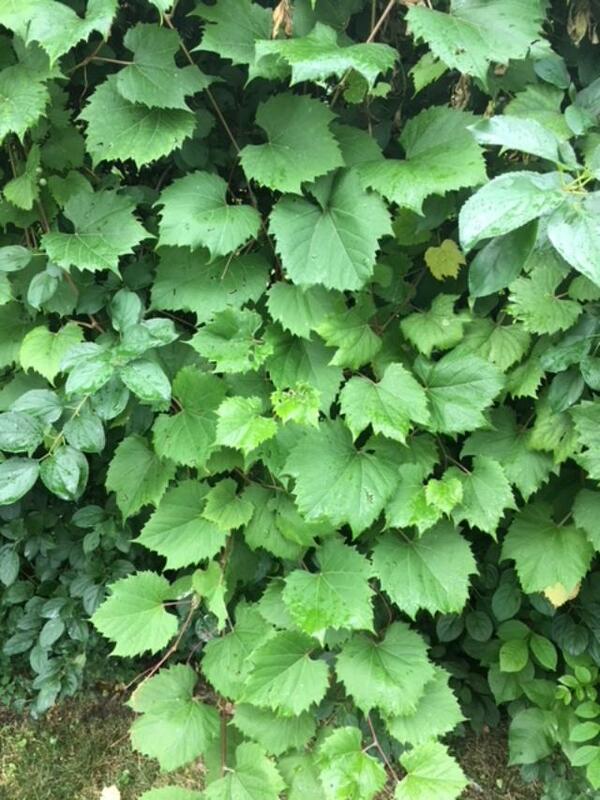 Yet still wild grape vines cover fences and climb tree trunks. Before the Japanese beetles chew them to bits, gather ye grape leaves while ye may. They are edible; they are free. Grape leaves play a role is all Mediterranean cuisines. 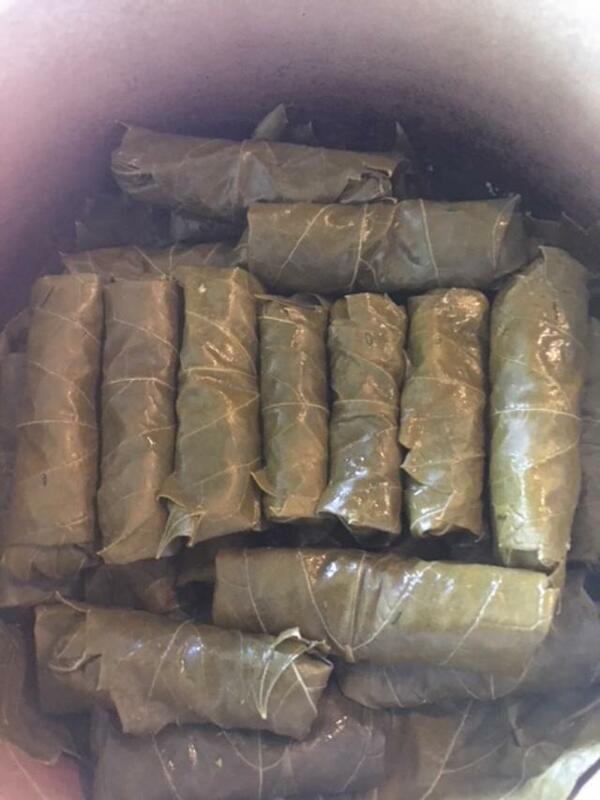 They cover fish for grilling, line pots for steaming and most notably hold rice or meat fillings for Greek Dolmades. Stuffed grape leaves make welcome appetizers, picnic food or casual snacks to keep in the fridge. You may buy prepared grape leaves in jars in supermarkets, or you may take a basket, scissors and clip some on a morning walk when it’s cool. Check the vines making sure you see a few tentative green grapes forming along the stems to insure you’re into the proper plant. When nibbled grape leaves are tart. To prepare for filling, cut any excess stem from the leaves and blanch them for two to three minutes in boiling, salted water. Once drained and cooled, the leaves may be stacked, wrapped and refrigerated or frozen. Lamb or beef fillings are common, but rice is a good keeper and accessible for a wider range of food preferences. 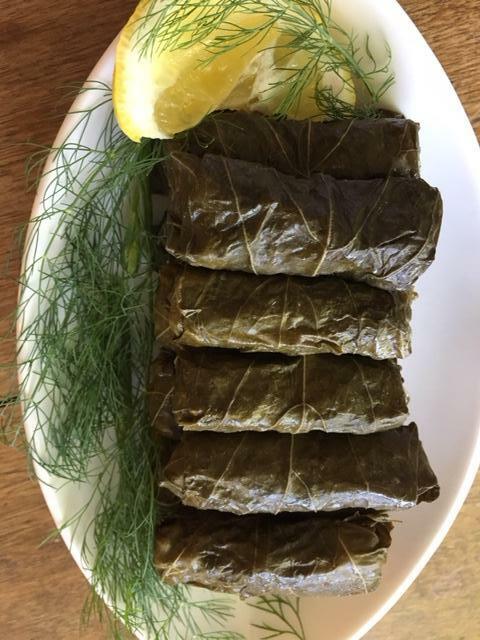 Made with organic brown rice, lots of fresh herbs and good olive oil, stuffed grape leaves are delicious to eat, highly nutritious and a summer’s delight. Trim stems from grape leaves, blanch is boiling water and cool. The leaves will lose their bright green color and turn drab; that happens to greens with acid content. 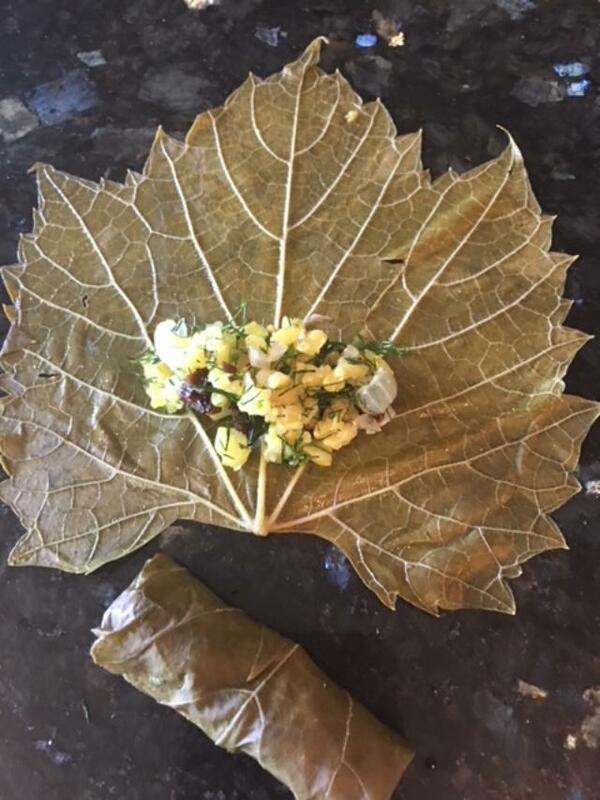 Grape leaves taste tart. Cook rice with turmeric and pinch of salt until tender but not mushy. (A rice cooker is perfect here; cook 1cup rice to make the cooker work properly–freeze half for the next batch of stuffed leaves or use for rice salad.) Gently saute onion in 1tablespoon olive oil until soft and translucent. Add garlic and optional chili the last couple minutes. Combine 1 heaped cup cooked rice, cooked onion, chopped herbs, currants and salt to taste. You are currently browsing the Mary Jo's Kitchen blog archives for July, 2018.